Over the summer I was on a real zucchini kick, and kept on trying out different zucchini bread recipes. 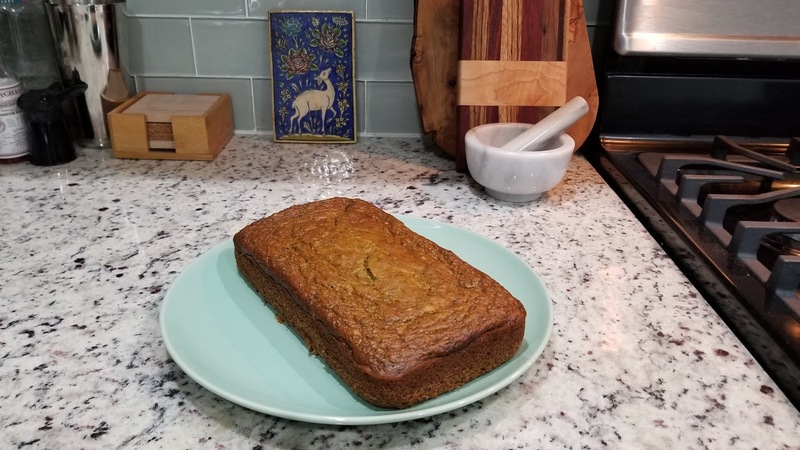 I was specifically trying to tweak and perfect a recipe in which you substitute applesauce for some of the vegetable oil to essentially make a low fat zucchini bread. This is tricky to balance, because it also adds sugar. However, an added benefit is that it makes a wonderfully moist bread. After months of experimenting, I think I finally figured it out. I took a loaf to a baby birthday party last month, and it got rave reviews. Give it a try and let me know what you think! Grate the zucchinis. You should aim for roughly 2 to 3 cups worth of grated zucchini. Preheat the oven to 325 degrees. Grease two bread loaf tins with butter. In a large bowl, briskly mix together all the wet ingredients. Add the spices to taste. In a smaller bowl, sift the flour, baking powder, and baking soda together. Slowly fold the drive mixture into the wet mixture. Finally, slowly fold in the grated zucchini. It's okay to take your time with this. It will allow the baking powder and baking soda to interact with the acidic apple cider vinegar and lemon juice. This will cause bubbles, and keep your bread from being too dense. Pour the mixture evenly into the two bread tins. Gently spin the tins to spread and even out the mixture. Bake at 325 degrees for 45 minutes, or until you can stick a tooth pick into the center of the top of the bread and pull it out cleanly. Remove from the oven and let cool on a rack. Wrap and store in the refrigerator after they reach room temperature. I usually eat a couple slices for breakfast with low fat cream cheese. They also make a nice addition to parties and potlucks when you ice the loaves with cream cheese frosting. But really, it never seems to last long, because low fat applesauce zucchini bread also makes for an easy, healthy, on-the-go snack.